Do what you already do - only better. Spray TUTSWVET onto your regular toilet tissue for a smooth clean comfort that is well beyond the softest dry paper. TUTSWVET effectively makes flushable wet-wipes obsolete. 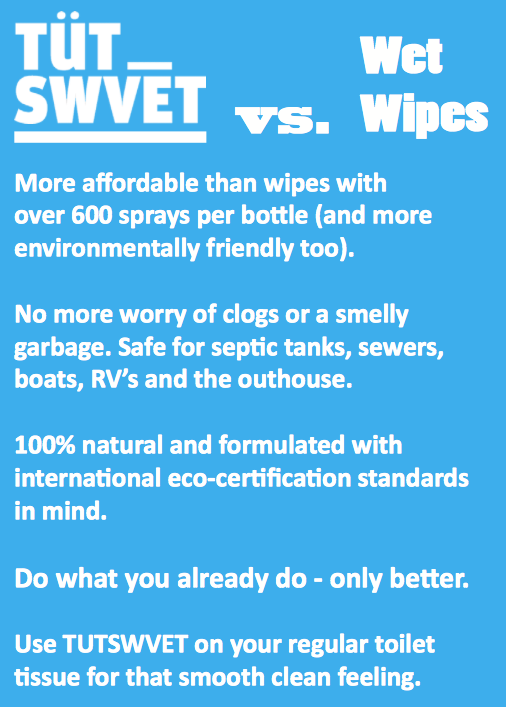 TUTSWVET is the solution to the current controversy surrounding flushable wet wipes. It allows it’s users to enhance their everyday toilet tissue in order to achieve the same smooth clean feeling with no possibility of clogging or interfering with waste removal systems. 100% recycled tissue is the environmental choice as living wood pulp is used for the softest premium tissue. TUTSWVET evolves the concept of comfort from soft to smooth to help save standing forest ecosystems. TUTSWVET is all natural and made in Canada. It has been formulated to perform with the most significant international certification standards in mind. No cutesy animal bums were harmed in the creation of TUTSWVET. In matters of cleanliness - moisture matters. Treat yourself to a clean feeling that begins with moisture, treat yourself to TUTSWVET. Over 600 Uses per bottle.